Roller Girl by Victoria Jamieson. Grades 4-8. Dial Books, March 2015. 240 pages. Review copy provided by publisher. Astrid is used to her mom’s “evenings of cultural entertainment”. She and her best friend Nicole have been dragged along to operas, art galleries, and poetry readings - usually stuff that bores Astrid out of her mind. But one night, Astrid’s mom takes her and Nicole to a roller derby… and Astrid’s life is changed forever. Roller derby is a sport played on roller skates. It’s fast and INTENSE. The ladies on roller derby teams aren’t afraid to get knocked around and they all have cool roller derby names like Scald Eagle, Scrappy Go Lucky, and Rainbow Bite. As soon as she sees it, Astrid knows she wants to try it, and luckily the Rose City Rollers are holding a junior derby camp over the summer. But Astrid's best friend Nicole isn’t interested in roller derby. Like, at all. In fact, she’s already signed up for ballet camp. So if Astrid wants to do this, she’ll have to do this on her own. And that will mean spending the entire summer away from her best friend. To make matters worse, when Astrid shows up for camp, roller derby is NOT as easy as it looks. In fact, Astrid pretty much stinks at roller derby. Does Astrid have what it takes to see this roller derby thing through? If you love the friendship story of SMILE by Raina Telgemeier or if you want to see what this crazy world of roller derby is all about, pick up ROLLER GIRL by Victoria Jamieson. What a great book! I am really excited to share this full-color graphic novel with kids at our book talks for 5th and 6th graders. We have a TON of Raina Telgemeier fans and I think this is going to be right up their alley. 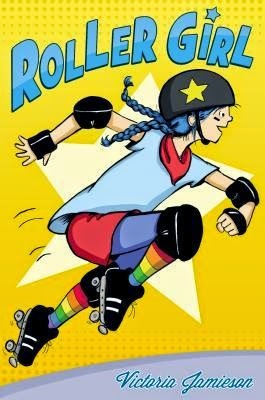 This is a great introduction to the sport of roller derby, something that a lot of young readers won't be familiar with. The reader learns about the rules and strategies of roller derby as Astrid's learning, so it happens organically throughout the story. This is a great story about middle school friendships and about girls starting to grow apart and get interested in different things. It's not an easy road to navigate, but as Astrid continues to attend derby camp, she learns about herself and how to deal with friends. One thing I really love about this book is that roller derby is not easy for Astrid. She's not a great skater and it takes a lot of hard work for her to even be okay at it. Because she loves it and because she looks up to the players on the ladies' teams, Astrid sticks with it. It's a great message for kids without being message-y at ALL. Well, definitely Smile by Raina Telgemeier. The themes of middle school friendships and learning about yourself are similar and the full-color artwork will likely appeal to similar audiences.